CD reviews: "Music From the Zydeco Kingdom," "Live at Slim's Y-Ki-Ki," "Positively Beadhead," "Waiting for the Sky ...," "Cajunization" and "1957: Solo Cajun Guitar"
These reviews first appeared in the January 15, 2000 edition of the American Reporter. They exist side by side, two distinct communities holding out in a French outpost in an English-speaking world. But they're different  that they insist on. Cajun and Creole, white and black. Both Francophones from Louisiana, to an outsider their musics can seem indistinguishable. Both play a straightforward two-step dance music built around the accordion, with lyrics generally in French. Anyone who reads Michael Tisserand's book "The Kingdom of Zydeco," though, will at least be warned that the two communities are fiercely protective of their respective traditions. The Creoles are descendants of the original French settlers of Louisiana and their African slaves; the Creoles are more recent arrivals, having been driven from French Canada by the British authorities before settling in the bayous. So despite Tisserand's exhortations, it just makes sense to consider Cajun and Creole music together. Tisserand's own contribution to recent releases of Louisiana's indigenous music is a disc meant to accompany his book from mid-1998 (which is an outstanding history and overview of recent Creole music). He traces zydeco from its early Creole roots (a 1929 recording by Amede Ardoin) to the latest dance bands (including young Chris Ardoin, a descendant of Amede's brother). 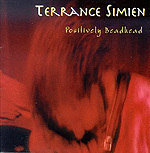 In his liner notes to the disc, Tisserand writes that he sought to create a collection that is both historical documentary and danceable party mix. He comes darn close, although some of the older cuts are more likely to provide a break from the dance floor than inspire much in the way of rug cutting. The 19 tracks aren't arranged in any particular order, either; it bounces from old-timey Creole dance tunes to the hottest youngsters. While that keeps things from getting too slow as a party mix, it also dilutes some of the documentary value. Tisserand has done a good job of getting representative tracks from the great innovators in zydeco: you'll find Clifton Chenier, Buckwheat Zydeco, Boozoo Chavis, Nathan and the Zydeco Cha-Chas and Queen Ida here. The accompanying booklet is informative and readable  and a nice teaser for Tisserand's book. 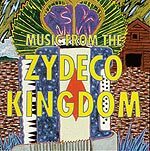 The combination of music and information makes "Music From the Zydeco Kingdom" one of the very best single-disc overviews of Louisiana Creole music. One of the young artists profiled in both Tisserand's book and compilation is Keith Frank. 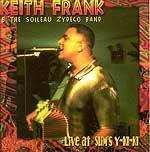 According to "The Kingdom of Zydeco," Frank practically owns the dance-hall scene in Louisiana, and has been selling his homemade cassette tapes for years. Only recently, though, has he been made available to a national audience. No telling if he's been wasting away on the local scene or if he's only now ready for the bigger stage, but Frank's debut on Shanachie is as hot a bit of zydeco has anyone has recorded in some time. Combining the traditional rhythms and sounds of zydeco with the latest dance R&B dance rhythms, Frank is redefining what zydeco is (and can be). This despite the fact that his accordion playing is merely competent, his singing voice passable. His real strength is as a leader. Frank has a strong knack for turning out well-rounded little melodies; only six of the 17 tracks on this disc are covers and there's not a dog among the bunch. (And at nearly 71 minutes, you couldn't have fit even another tune on here  the man believes in giving his fans value for their money.) "You're Breaking My Heart" is as radio-friendly a number as Buckwheat Zydeco or Clifton Chenier ever recorded. With his youthful appeal and strong songs with a dance-ready back beat, Frank could be the long-awaited breakthrough artist to carry zydeco to the mainstream. Terrance Simien first hit the national stage via a cameo performance in "The Big Easy," the Dennis Quaid-Ellen Barkin mystery set in New Orleans. His reputation is that of being one of the best showmen in zydeco, with live performances considered not-miss events. His latest release captures much of the energy of a live show. His band, the Mallet Playboys, just sizzle, he's assembled a strong collection of covers and new originals  and the arrangements show off both the songs and the musicians' virtuosity. Simien possesses one of the sweetest voices in zydeco. You might not confuse him with someone of the stature of Aaron Neville, but he's far better than most. He's also a first-rate accordion player, able to hold his own on any stage, anywhere. Add it all up  top-rank playing, great songs, charismatic leader in his groove  and the result is one of the most polished, listenable zydeco albums yet recorded. Lisa Haley is part of the Louisiana expatriate community living in California (a community that includes Queen Ida, among others). In her liner notes, Haley says she is Cajun by birth. But she plays both Cajun and zydeco songs, plus folk songs that she Cajunizes. And her own songs, too. She's a sharp fiddle player  perhaps not as good as an Alison Krauss or Laurie Lewis, but not so far removed, either. As a singer ... well, as a singer she's a pretty good fiddle player. Still, Haley won't embarrass herself singing  she's never out of tune, and what she lacks in range and strength she compensates for with a wry humor that underpins every song. Her Zydekats band is tight; David Jackson in particular does a nice job with accordion. (And Steve Forman's tuba on "Waiting for the Sky to Fall" lends just the right traditional touch.) Every song swings, and there's a sense of fun running throughout. 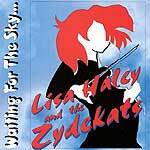 What is most rewarding about this release (her second) is the fact that Haley disregards the rules about keeping Cajun and zydeco distinct, and just plays some great French-American folk music that's easy to dance to and even easier to listen to. BeauSoleil are the undisputed kings of Cajun music; no other band comes even near them in popularity or influence. In fact, they've gotten so big that their albums are no longer confined so strictly to Cajun music. Their newest release, "Cajunization," ranges from Cuba to Maui to Mississippi. Bluegrass star Jerry Douglas sits in on both dobro and Hawaiian guitar. And there are, of course, several traditional Cajun tunes. BeauSoleil remains largely fiddler Michael Doucet's vehicle. He wrote or co-wrote a full dozen of the 14 tracks here, sings lead vocals on most, and wrote the liner notes. The Cuban and Hawaiian tunes came from his pen, and he even wrote the blues. Doucet's vision seems to be that of a fully Cajunized world; both "Cubano Bayou" and "Les Nuits a Maui" manage to make Havana and Hawaii seem, well, Cajun (the man could probably make a pineapple jambalaya, and make it work). As with all BeauSoleil albums, the musicianship is the very best, the arrangements swing easy. 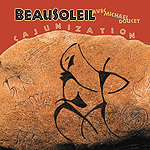 David Doucet, Michael's brother, is the longtime guitarist for BeauSoleil. His latest project is an album of traditional Cajun melodies played on solo acoustic guitar with vocals. It's kind of like John Fahey or Leo Kottke might play if they'd been raised on the bayou. Doucet shows himself to be a fine fingerpicker; his arrangements bring out intricacies in these old melodies only hinted at in their original form. While he doesn't get much chance to show it in BeauSoleil, David Doucet is a fine singer, possessed of a warm voice with nice resonance. And getting to read liner notes by Duck Baker  one of the best pickers ever to pick up a stringed instrument  is a treat in and of itself. Baker knows guitar like Einstein knew electrons, and his introduction to this album is treasured reading.